Why is collaboration in healthcare so important? Why are all voices needed to achieve the best outcomes? I have spent the last 10+ years working as a Quality Improvement Consultant in the healthcare system. Much of this time has been spent working directly with safety net primary care practices. The providers and staff at these practices are hardworking, mission-driven people who are really doing their work with the intention of making things better for their patients. And yet, there have been many times and many moments when I’ve been rendered completely speechless (no easy feat) by a comment or a process that is so NOT patient-centered. How can these bright, amazingly gifted people not see that what they are doing isn’t the best approach or process for their patients and families? Please don't misunderstand, I am not writing this to be in any way disparaging of the work or the people. But it illustrates an important point and something I have come to realize is that we – as humans – sometimes lose site of the importance of asking others what really matters TO them when we are doing something we think matters FOR them. Case in point: when my oldest son was about to turn six (he is now 16), I planned an over-the-top car themed birthday party. He loves cars! Of course this was going to be just perfect for him. Two days before the party, he was crying in the kitchen telling me he didn't want a car party. He actually said, ‘…but you didn’t ask me, Momma…’ Hmmm… I was so sure that what I was doing for him was the best thing. My intentions, my efforts were good; my assumptions weren’t. I hadn’t asked the person with the biggest stake in the game what mattered to him. Part of my time is now spent working for ImproveCareNow (ICN), an innovative network of mission-driven care centers working tirelessly to improve the care and outcomes for pediatric patients with IBD (Crohn's disease and ulcerative colitis). If you read this blog regularly, you know some of the stories and the people involved. The physicians and care teams have shown what real improvement can look like. The remission rate (77%!) is impressive and was unprecedented prior to ICN. But, we aren’t at 100%. Now is the time to broaden the pool of collaborators, to include the voices of ALL stakeholders in the effort. It is time to start asking 'what more can be done', or 'what can be done differently to increase the remission rate even more?' ICN wants the opportunity to build a truly collaborative network that includes leaders from ALL healthcare stakeholder groups at the table - patients, families, care teams, and researchers. 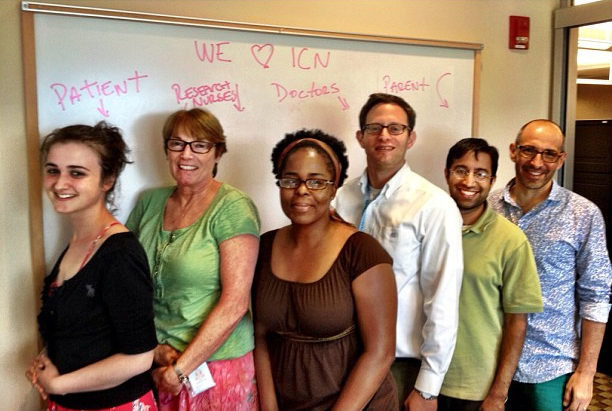 ICN wants to be a network truly led by those with the biggest investment in the outcomes. ICN wants all children and young adults with IBD to get better, faster. Can you help? Will you help by September 15th? If you haven’t already, please go to healthiertogether.org and support the campaign by sharing a story or picture or video or statement to let us know that you also believe collaboration of this kind in healthcare is so important – to you, to your family, or to others you may or may not know. To truly improve the system of healthcare, we need to hear all voices. We need to hear from you to improve care NOW.